A year ago, like a herd of buffalo being stampeded toward a cliff, people in my neck of the woods were convinced that "we must get rid of Harper" in order to "save the environment." When I asked such people what it was that Harper was doing that was so damaging to the environment, they all spewed the party line. "He's stripped the country of all environmental regulations." It came out like a programmed response. However, when I asked them to give me a specific example, without exception, no one could tell me. No one could name a single one of those environmental "regulations." Of course, Harper did remove several regulations, and worse than that, muzzled scientists in Environment Canada who might spill the beans as to what was happening in the Canadian north. Canadian scientists were understandably enraged. OK. But the point here is that herd animals are not driven by any intimate knowledge of the issues that animate them, but by the instinct to follow their leaders. In that respect, political parties resemble religious congregations, and their conventions are more like revival meetings than symposiums. None more than the NDP. Mulcair (leader of the Opposition NDP) vowed that he would, as he put it, "get the oil to market" — but only after the restoration of regulations that would ensure that it was extracted and delivered in an "environmentally responsible" way. But isn't what happens after the oil reaches the market the major issue here? No one buys oil without the intention of burning it. So isn't this talk about environmental responsibility just so much Greenwash? Would it not be akin to Göring or Hitler assuring Londoners that V2 rockets would be assembled and delivered in an environmentally responsible manner in full compliance with tough environmental regulations? Thanks to the government's tri-partisan policy on immigration, we have seven million more consumers today than we did when the Kyoto accord was signed. These extra people are emitting twice the amount of GHG emissions as the whole Alberta tar sands project. And BTW, this population growth has despoiled twice as much land as the tar sands project. We are not talking about boreal forest here, but some of the best farmland in the country. That's when the conversation ended. It was a show-stopper. In one case, though, it spiralled out of control. On a dark damp October night two days before the federal election, a neighbour down the street yelled at me, "Immigration has nothing to do with it!," and stalked off down his long driveway. Another neighbour to the south, on the other hand, just turned away. She hasn't spoken to me since then, almost a year ago now. That's the more typical reaction. Silence and withdrawal. Immigration is a no-go zone, and if you press the issue you are a no-go zone. Presenting arguments that they cannot refute only hardens their position. In essence, I have attacked their religious beliefs. There is no greater sin than that. In fact, Prime Minister Trudeau is rumoured to introduce legislation patterned on Quebec's Bill 51, making criticism of Islam a criminal offence. In other words, he plans to re-establish good old-fashioned laws against 'blasphemy'. Like so many 'progressives', that is, regressives, he is of the view that ideas and ideologies should enjoy immunity from comments, criticisms or depictions that might hurt their adherents' feelings. To do so would be "divisive" and "non-inclusive," and that wouldn't do. Not in today's Canada. "Diversity" and "inclusivity" are central to the catechism of our State Religion. Better include those words on the protected list too. So it should come as no surprise if any criticism of immigration policy may one day be subject to state punishment to complement the public shaming of blasphemers in social media and the employer sanctions that follow. Especially if Trump should be defeated. Opinions that are perceived to be remotely "hurtful" will be excluded by nervous editors. 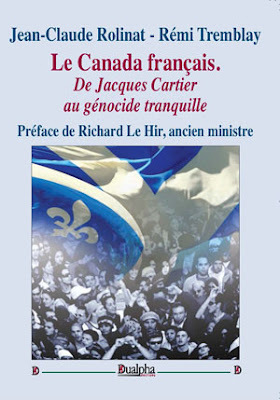 The chilling effect will extend far beyond legal definitions of un-Canadian utterances. To prepare the ground for this tight constriction of "anti-immigrant" speech, we are now witnessing a number of articles, op-eds and radio commentaries that argue for a spectacular increase in the government's annual immigration intake. It seems like a replay of a similar campaign conducted some five or six years ago when people like Irvin Studin and Steve Lafleur were given free rein by the CBC or other MSM outlets to promote their vision of a Big Canada. Only this time, we can expect that this "Second Wave" will be wider in scope and more strident in tone. It seems that a belief in open floodgates is destined to become one of those core Canadian "values" that Justin Trudeau talks about. In the past week the Conference Board of Canada also proposed increasing our population to 100 million — hardly surprising since the Conference Board is funded by corporations and promotes their interests. Immigration Minister John McCallum is mentioned in the article as wanting to "substantially" increase immigration — which indeed he announced some weeks ago was his objective, notwithstanding the admission that work had to be done to convince Canadians this was a good idea. As far back as April 2001, McCallum began touting the idea that we should increase the population to 100 million. This from one of Justin Trudeau's frontline cabinet ministers. 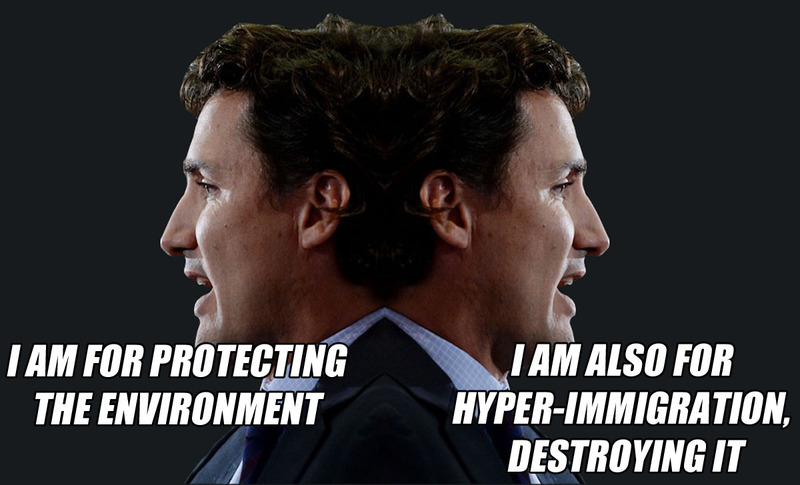 That's Justin Trudeau, the "pro-environment" politician and climate change warrior. It is amazing what Justin can get away with these days. He can visit a mosque and appear in a Pride Day parade in the same week. He can argue for economic growth and lower GHG emissions and a "clean environment" in the same speech. He can shill for big corporations and at the same time enjoy the support of credulous dupes who regard him as Nature's advocate. This guy is a better actor than was Ronald Reagan. Proof positive that the Liberal Backroom Boys knew what they were doing when they chose a high school drama teacher to channel the Bay Street agenda while dressing it up in the clothing of social justice, tolerance and environmental sustainability. An airhead who can cloak his ignorance with politically correct platitudes with complete confidence that his adoring flock will not take a look at what is under his glossy, flowing hair — the vacuous mind of a preening charlatan. He can read the lines. That's enough. Our Honourable Immigration Minister McCallum surprised everyone yesterday by saying that he would establish 300,000 immigrants per year as the "foundation" of future immigration intakes. The expectation was that he would set the bar much higher, as high as 450,000 per annum. CBC reporters were visibly crestfallen. McCallum said that 300,000 is as low as it will get. The permanent benchmark. He tried to appease the growth lobby by saying that this platform was 40,000 immigrants higher than it was two years ago and that since there were many good demographic and economic reasons to increase immigration, he hopes that there will be future growth in immigration over the next five years.